This we LOVE! 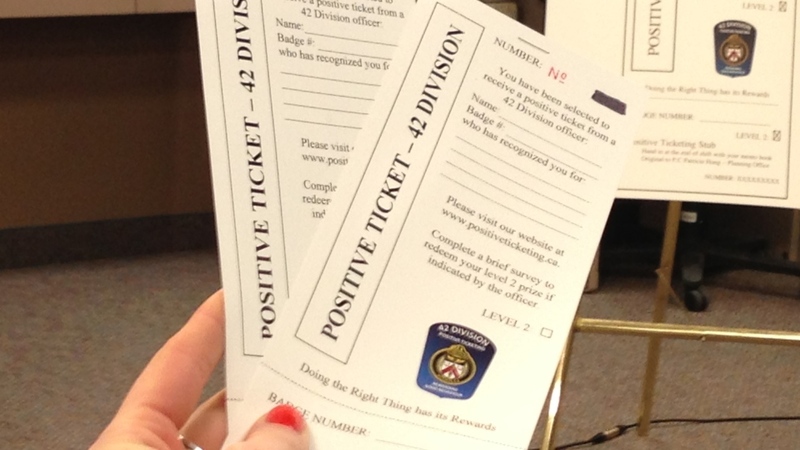 A police force in Canada has started handing out rewards to young people who do good things for their community. Officers in the city of Prince Albert, in the central province of Saskatchewan, will dish out the “positive tickets” to youngsters who are seen crossing the road safely or picking up litter, the CBC news website reports. The rewards on offer include free hamburgers, cinema tickets or a chance to see the local hockey team in action, all of which have been donated by local businesses. The initiative rewards young people who make “healthy, positive choices in relation to their behaviour, decisions or actions”, the force says on its website. “One officer is recognising a group of school children that call themselves peacekeepers,” Sgt Brandon Mudry tells the BBC. Officers are hoping to build up a rapport with young people using “a less authoritative approach”, and think that offering something of value will help. “Once they realize they are receiving a positive ticket for doing something good, it seems then that they calm right down and then they are appreciative,” PC Rob Lindsay tells CBC. And with such appealing prizes on offer, the city’s young people “may start seeking out police officers in hopes of getting caught,” the CBC report says. This is outstanding. Police gold stars. We all need them.